Because you need one more thing to do with all that washi tape you’ve been hoarding, here’s a very simple project to turn your rolls of loveliness into three-dimensional blooms. 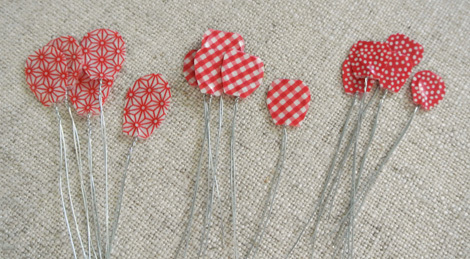 Cut 6-inch lengths of wire, one length per flower petal. 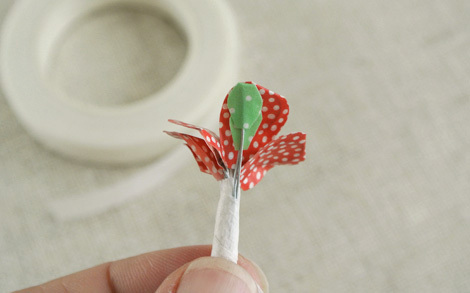 Wrap the center of each wire around a pencil, marker or other round object less than the diameter of the width of your washi tape to create petal loops. Adjust each wire loop to preferred petal shape. 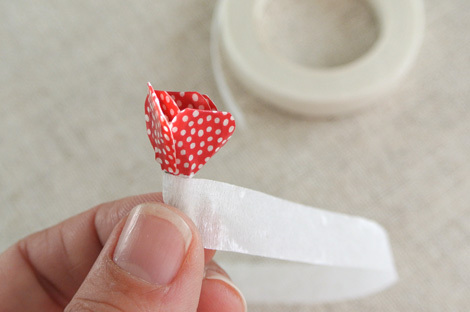 Trim a piece of tape a little over twice the height of your petal loop. Place loop onto lower half of tape and fold the remaining tape over. Press together firmly. Trim corners to create petal shapes. 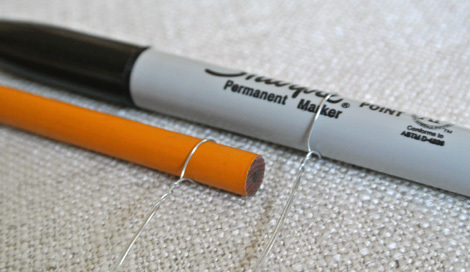 For leaves, repeat the petal steps using only a 3-inch section of wire without loop and trimming to leaf shape. Turn wire and repeat at the other end. 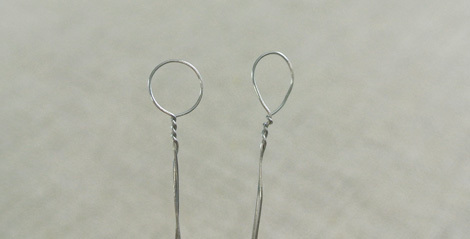 Fold double leaf wire in half. 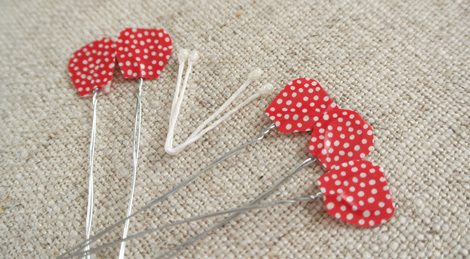 Make different sizes and shapes for different color and patterned flowers. Vary your stamens per flower style. Fold two stamens in half and place between 5 flower petals. Wrap petals and stamens tightly together with floral tape beginning at the base of the petals. 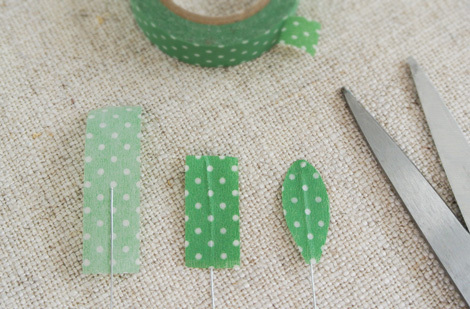 Wrap tape around wires several times before adding leaves. 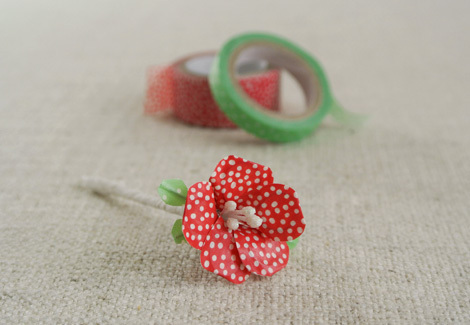 Place the folded wire leaves section against the flower stems and continue tightly wrapping with floral tape, wrapping to the end of your wires and just slightly beyond before tearing off the end of the tape to finish. Separate and bend flower petals and leaves to desired shapes. Adhere washi tape flowers to hair accessories, wrap stems with ribbon or contrasting washi tape and pin as buttoniers, or add blossoms to gift packaging. I gathered three flowers together and tucked them into my silver basket vase pin. This entry was posted in general craft, Jewelry, Paper Crafts, Paper Tape, Washi Tape and tagged washi tape flowers. Bookmark the permalink. Wow these tiny flowers are awesome! Thanks for sharing this idea. I love it. The CUTE never stops comin’ from lovely YOU! These ARE breath taking! Fantastic! Can’t wait to make some of these…so many ways to use them. How darling! I have several metal thimbles that I was trying to come up with an idea for. You brooch and flowers made the light go on! Thanks! Just so pretty! You always share such wonderful ideas with us Cathe and these are perfectly lovely. Definitely want to try them – and I love your little basket brooch. I’ll be looking out for one of those! Fantastic idea for my washi tape. Now I think I need to get some more. Thanks for sharing. I have yet to ever try Washi Tape. 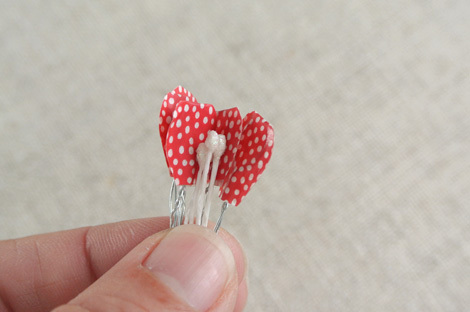 Looks like I need to go for it and make some of these adorable flowers. 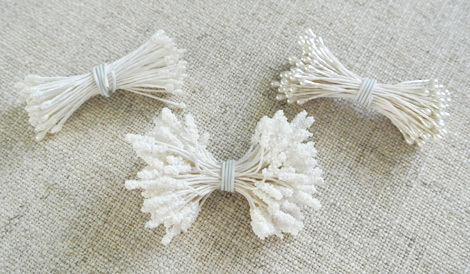 Can think of many ways to use them and would be such a relaxing craft to make. Thanks Cathe! You are such a great inspiration to all of us. I adore these! They are so sweet. Hmmmm, I still do not have any of this tape! I might have to change that now. LOL. 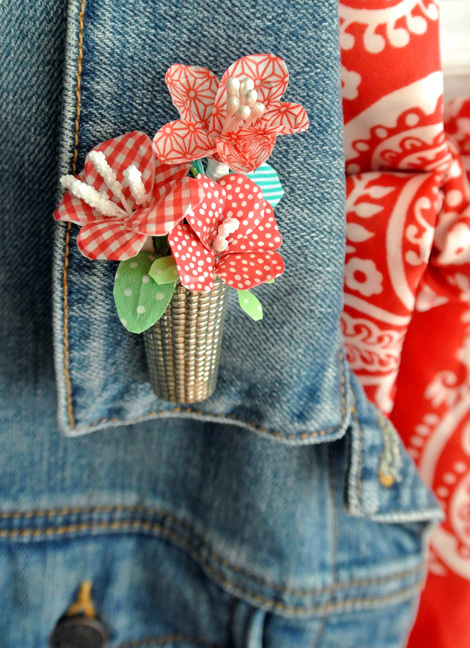 I love the brooh but love, love, love the silver basket vase pin … where did you got it?!!! Linda suas flores, e fáceis de fazer, obrigada por compartilhar essas idéias criativas. I like what you did with these flowers. Keep up the good work! Ooooh, thanks so much for this beautiful tutorial. Adorable! Thanks so much for the tutorial! Love this idea…thanks so much for the tutorial! 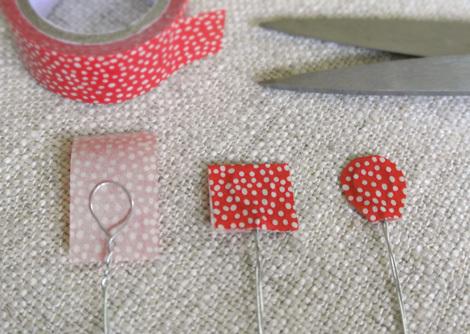 Thanks for sharing this amazing tutorial…these are so cute!! son monisimos, y muy cucos, donde puedo conseguir los pistilos de la flor?? What adorable flowers. My favorite thing in the whole wide world and you bet I will bookmark this page and get me some tape and wire so I can try this thanks for sharing. Love them. Thanks for sharing the idea, these flowers are really pretty! woooow they are beautiful and sooo pretty, love it. Really enjoyed this craft love that it cn be dessed up or toned down. 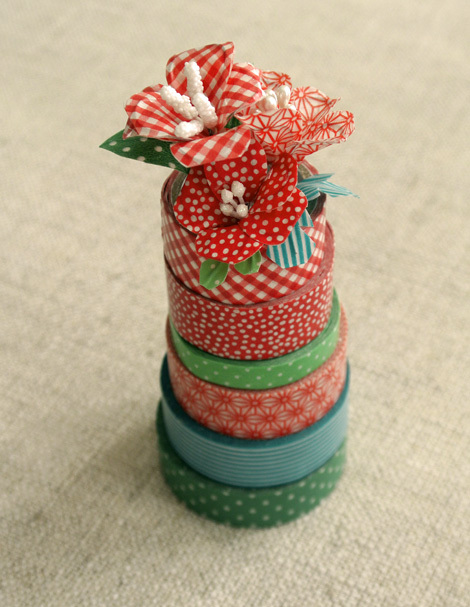 Thank you for creating and sharing your gorgeous washi tape craft! Your craft was featured on my site this morning as part of my 10 Easy and Awesome Washi Tape Crafts round-up. Those are adorable! 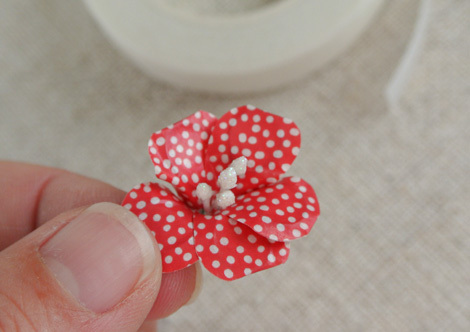 Going to try this for sure, been on a flower making roll lately. Oh, great. I’ve successfully avoided going down this particular rabbit hole but now I see where I might need to start accumulating some of the cute stuff! Love the pattern for the washi flowers. I work as an activity aide in a nursing home and can’t wait to make these with the residents. Will look forward to you new videos. I love these little flowers!! I love your website and store too. Shame we are on the other side of the pond in the UK!